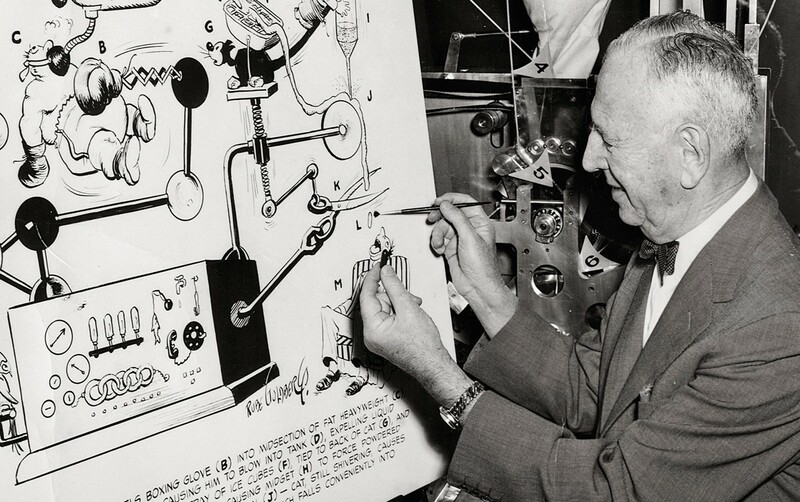 As some of you know I’m a fan of Rube Goldberg Machines – those silly, over-engineered contraptions which make simple tasks overly-complicated. We started by writing out a list of all of the different ways sounds are made and instruments work and figuring out which instruments and objects could make the sounds needed to accurately reproduce the song. We spent a month in warehouse outside of L.A. with Noah Vawter from MIT and our friend Paul Rudolph from a band called Glank — all of their instruments are from junkyards. So we spent months trying to figure out what sorts of instruments you could play at 40mph and how to bring them to the desert. We bought the cheapest pianos we could find from thrift stores. I had to tune 58 pianos because I wasn’t sure how many we needed. I spent three days tuning those pianos. Then we planned the course and figured out the parts that needed to be repeated. The chorus is basically looped since that appears three times. We spent a lot of time walking out the track with a measuring tape because we had to know how long something is and how fast we’d be going. Originally we thought we’d be doing 25mphs, and when we did camera tests it looked too slow. I also started taking stunt driving lessons by the Crowder family who are professional Hollywood stunt drivers — they drove in movies like “The Fast And The Furious.” It was really really really fun, and I am now not allowed in cars with handbrakes because it’s so tempting. But I realized I could do between 25 and 40 throughout the course. Then we spent about a month building in the desert with a construction team and then four days of shooting. When we were shooting, we focused on playing each section of the track. We ran it in full passes but recorded each part on its own to focus on getting each part exactly right. When we were done we had 189 tracks we had to figure out how to mix together back into the song. If you watch other music videos by OK Go you’ll quickly realize that, while musicians, these guys are serious nerds. It’s like finding my people.